- 2500 mm No. of clamp 2 3 Max. Sheet Thickness 4 mm (MS) 4 mm (MS) Maximum feed rate 42 m/min 42 m/min. 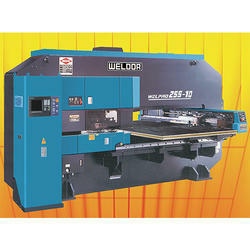 We are offering CNC Turret Punch Press to our clients. 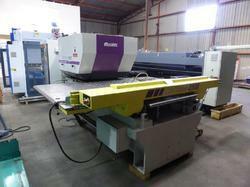 Our clients can avail from us a wide collection of best quality CNC Punching Machine. These products are made from high quality materials. The Wiedematic W-Series press is a numerically-controlled turret punch press designed for fast, accurate sheet metal piercing. Positioning of the table, turrets, press tripping cycle and various auxiliary control functions are numerically controlled. Each function can also be manually controlled as required. We are amid the most noteworthy names engaged in offering to our clienteles an extensive collection of Semi Automatic CNC Punching Machine. The MAG B line is the economical solution for the structural steel and steel tower industries to produce plates and gussets. Quality being the prime concern, we offer an exceptional range of CNC Turret Punch Machine that are acclaimed for high quality and wide applications. We offer them in different sizes and require low operational cost. We offer them in varied strength capacities and are offered at most affordable rates.